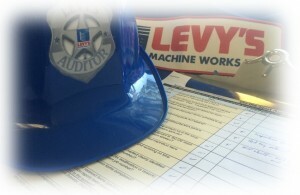 ﻿ The Benefits of Involvement – Employee-administered mini-audits | Levy’s Machine Works Ltd.
Getting all employees to buy into and develop the same level of knowledge and understanding of a company-wide system, process or initiative is a challenge at the best of times, no matter how conscientious and dedicated they may be. Nonetheless, it is absolutely essential to ensure that a system is being used properly to fully serve its purpose and that all processes and procedures are continually evaluated and improved. This applies without exception to a business’s quality management system (QMS). But how do you regularly evaluate without slowing the process or incurring many hours of downtime – time and cost which can smaller business in particular can often ill-afford? Training during implementation usually ensures that processes are followed and correct documentation completed at the outset but over time steps may be inadvertently missed or corners cut. Dedicated staff overseeing proper use, monitoring and correction may address this but is often another overhead smaller businesses can’t justify. Alternatively, bi-annual or even annual audits will identify and correct any issues but by the time this happens any accumulation of neglect or misuse can result in a whole whack of additional work to get things back on track. Indeed, the benefit of getting more employees involved includes each individual gaining personal knowledge through first-hand experience of the processes, regardless of whether they use them regularly or not. This in turn provides them with a better insight into how all processes and procedures interrelate and interact within the company-wide system, as well as an appreciation of how the business operates overall. Furthermore, it helps them to become more engaged and comfortable with taking on a bit more responsibility. And, with regard to cost to the business, this is relatively insignificant as these mini-audits can generally be completed within an hour or less. Calgary-based precision machining business Levy’s Machine Works began to conduct employee administered mini-audits recently, following its implementation of a new quality management system and successfully obtained ISO 9001:2008 certification in 2015. As a QMS had been in place at Levy’s for many years prior to obtaining the certification most employees were already reasonably used to working with processes such as part inspections, non-conformance reporting, formal job routings and shipping/receiving procedures. That said, more stringent processes and procedures were developed to meet the standard, which in turn meant further instruction on how they worked and were to be followed. How and why the QMS needed to meet the ISO standard was also a focus as was its importance to the business overall. Once in place it was obvious that the QMS and the way in which employees worked within it needed to be continually evaluated and maintained to remain effective. So, the objective of the employee-administered mini-audits was to keep the business ‘fighting fit’ in terms of being able to pass the most stringent of external audits or customer inspections at any time. One key benefit of having different employees involved as opposed to just, say, the quality lead is that a fresh pair of eyes is often more likely to see problems that the same pair of eyes may miss. It also helps provide a more ‘level playing field’ in terms of everyone audited and everyone being scrutinized, rather than one person doing the policing and everyone else being policed. In fact, with everyone having the chance to audit as well as be audited a it also creates an opportunity for some healthy competition, with the auditors keen to find room for improvement while the auditees not wanting to be picked up on doing anything less than a thorough job. To properly get the employees’ ‘buy in’ though the task had to be made as easy and not at all daunting, particularly as it involved auditing processes with which they were otherwise unfamiliar. So, information from the initial QMS training presentation on the processes in use and the types of things to remember were used to create a checklist that would verify that processes were being followed, documentation completed and records kept. Simple questions were written alongside each of the ‘fail’/’pass’ checkboxes so that even the most laymen auditors could question those using process within each functional area. Ultimately this enables the auditor to determine whether the process was being followed and allows them to see first-hand how that aspect of a process worked as the auditee must provide an example of correct use. Prior to each mini-audit the selected employee is fully briefed on what to do and why it is important. In addition to the checklist and a clipboard, mini-auditors are also given the ‘Auditor’ hard hat and badge so everyone can see that they have been tasked with conducting a mini-audit audit and therefore provide them with the responses and information they require. However, no advance warning is given to other employees as these inspections have to be impromptu to properly assess what is being done in the everyday situation. Also, every area, every process and every employee is subject to scrutiny, from the production staff and shop floor through to the management and main offices. Like any initiative that may involve employees working outside of their core area (or comfort zone) there was the risk that many may be reluctant to take part and half-hearted execution would provide only mixed results but Levy’s experience with the mini-audits so far has been extremely positive. Each employee chosen to undertake an audit has thoroughly enjoyed the experience, with any initial reluctance turning to enthusiasm as they gained a better insight and understanding of how each of the QMS processes interrelate and interact. Improved understanding and appreciation for how the business operates seems to have made them a more integral part of the business as a result, their viewed responsibility now extending beyond just their ‘job. Moreover, the mini-audits serve their purpose with resounding success, with occasional missed steps or incomplete documentation being identified and reminders issued to prevent further occurrences. In conclusion, the quality management system at Levy’s and all of its processes and procedures will remain in great shape because of its employees and their regular checks. Also, every employee having conducted a mini-audit goes on to make it their business to ensure they properly follow the processes and complete documentation going forward ….even if it’s just to make life a little harder for the next mini-auditor!